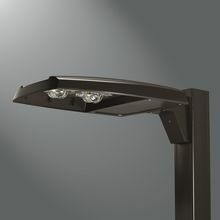 Eaton Lighting is proud to introduce the latest member of the Lumark family - Prevail. This area lighter boasts new features including universal mounting bracket and front wiring for ease of installation. The look is sleek and modern, and utilizes chip-on-board technology to keep the costs down. Best of all – Eaton will be stocking these in Mississauga. When asked to replace anything up to 400W, think of the Prevail as an option.